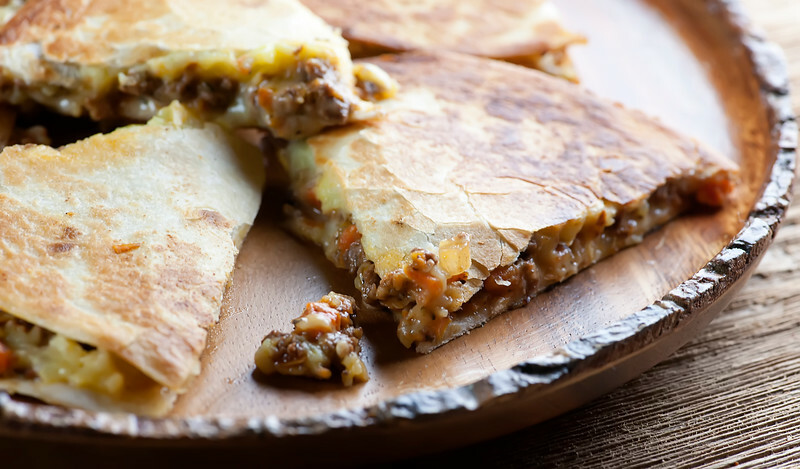 These Irish themed shepherd’s pie quesadillas are addictive on St Patrick’s Day and every day! Grab some tortillas and put this easy recipe to work! I know, my Irish mother is probably reading this post right now, the day before The Day (as we refer to St. Patrick’s Day in my house) and wondering where on earth she went wrong…but I promise that if you look around a little on this website and many others you can absolutely find recipes for Irish brown bread and scones and many other delicacies from the land of my ancestors. But I’m guessing this is the only place you are going to find the delicious travesty that is shepherd’s pie quesadillas. Crisp tortillas stuffed with a mixture of tender beef and carrots, mashed potatoes, and a little bit of cheddar cheese. Irish cheddar cheese, please…we need to be authentic. Let’s make it! To make matters even worse, I do know that shepherd’s pie – the classic kind – is made with lamb and not beef. 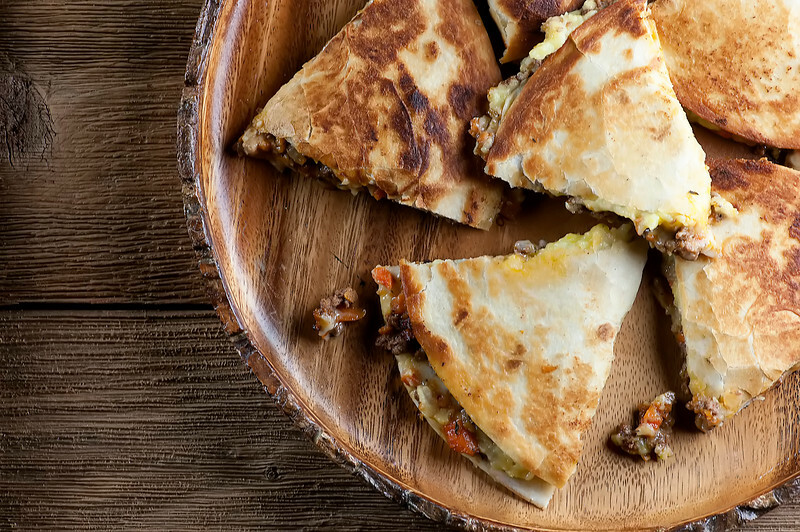 But since I have gone WAY out on a limb anyway, I’m making these with beef, because that is how I like my inauthentic regular shepherd’s pie, so why should my shepherd’s pie quesadillas be any different? This is a great way to use up leftover mashed potatoes, but if you don’t happen to have any of those lying around, you can make your own small batch in two shakes. At the same time, you want to stir up a mixture of ground beef, chopped carrots and onions with a little tomato paste and Worcestershire sauce to make the delectable filling. 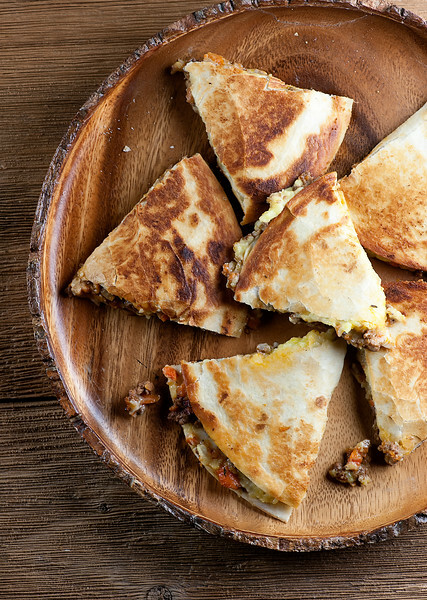 Once you have all that on hand, it’s time to assemble your Irish quesadillas. Spread some flour tortillas with a generous dollop of mashed potatoes, and then layer some of the beef mixture on top. Sprinkle everything with some shredded Irish cheddar, and pop another tortilla on top. Now heat up a big skillet and lay each quesadilla down to brown up. When the first side is browned, use a big spatula to flip it over to get the second side brown. After all your quesadillas are browned, all that’s left to do is cut them into wedges. And you know what works great for doing that? Your handy dandy pizza cutter. Yep. Introducing a little Italian into the mix, because St. Patrick’s Day is for EVERYONE. Enjoy The Day! Cut the potatoes into 1-2 inch chunks, cover them with water in a medium pot and bring to a boil. Simmer until the potatoes are tender, about 15-20 minutes. Drain and return the potatoes to the pot. Add the butter and mash the potatoes with a potato masher. Add the milk and mash again. Season to taste with salt and pepper and set aside. Heat the olive oil in a large deep skillet over medium high heat. Add the onions and carrots and saute until the onions are tender, about 5 minutes. Add the Worcestershire sauce and the beef and stir until the beef is browned and cooked through. Stir in the tomato paste and stir for another minute or two. Assemble the quesadillas as follows: Lay four tortillas out on the counter. Divide the mashed potatoes among the four tortillas and spread the potatoes to cover each tortilla. Divide the beef mixture among the tortillas and spread it to the edges. Sprinkle with cheese and top with another tortilla. Heat a clean large skillet over medium high heat. Place each quesadilla one by one into the pan and brown both sides, flipping them carefully when the first side is done. When all the quesadillas are browned, cut them into wedges (I use a pizza cutter for this) and serve at once. After working a long week???????? My pleasure – you know how I like to mess with the classics! Hope you had a great St Pat’s! OK, so how creative are these Kate?! Awesome idea for St. Patrick’s Day! My husband would love them! I’m sure your mother would love these! You pretty much can’t go wrong with all those flavours and perfect St. Patrick’s Day eats, in my opinion, especially with a pint of Guinness ;) Happy St. Patrick’s Day! I love this idea and they look delicious! Your mother will be proud! Shepherds pie + quesadilla? Genius! These look cool. And yes Shepherds Pie is usually made with lamb mince. (Yes I am from Australia). Freely available here, but if others work, so be it. I am currently trying to perfect a Lasagne Meatloaf. The workings are there, just need refinement. Seems we both like looking outside the square.. Thanks so much – we are making them again this week!